IBM® Rational® DOORS® lets you manage requirements documents centrally for better collaboration. It provides access to editing, configuration, analysis and reporting capabilities through a desktop client. Additionally, it supports the Requirements Interchange Format, enabling suppliers and development partners to contribute requirements documents, sections or attributes that can be traced back to central requirements. Plus it records and displays requirements text, graphics, tables and more. 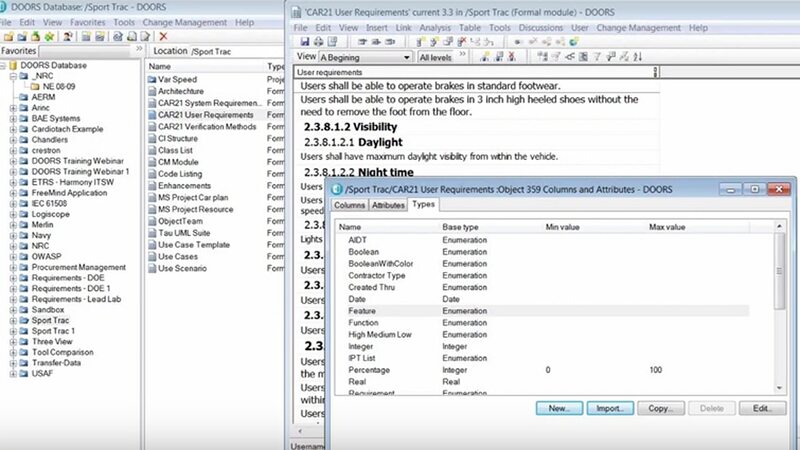 The solution provides a drag-and-drop capability that links a requirement to a design item, a test case or another requirement. Pick requirements from a list or enter requirement numbers as attributes, and Rational DOORS will create the links for you. It offers full traceability reports in a single view to help prioritize development work and predict delivery schedule. Plus it supports external links that enable requirements to be directly associated with information outside of Rational DOORS. Rational DOORS offers an explorer-like hierarchy with multiple levels of folders and projects for simple navigation no matter how large the database grows. It includes configurable views and sharable documents, which enable users to work concurrently to produce a single document. The solution can scale as the project demands from small teams to complex, global projects. Rational DOORS includes a test tracking toolkit that enables you to create links from requirements to test cases. You can define test cases, records and compare test runs. The solution ensures that all requirements are covered by test cases. The Rational DOORS Web Access add-on provides greater functionality by offering web-based access for creating, reviewing, editing and discussing requirements held in an IBM Rational DOORS database. The solution helps you manage changes to requirements with either a simple pre-defined change proposal system or a more thorough, customizable change control workflow with Rational change management solutions, including IBM Rational Quality Manager, IBM Rational Rhapsody® and IBM Rational Focal Point. It also integrates with HP QualityCenter for visibility of requirements to create test cases for traceability and with Microsoft Team Foundation Server (TFS) to create and maintain traceability. IBM Rational DOORS Next Generation provides a scalable solution to optimize communication, collaboration and verification of requirements throughout your organization and supply chain—and improve management of project scope and cost. It uses the IBM Jazz™ collaborative lifecycle management platform to help you capture, trace, analyze and manage changes to requirements while maintaining compliance to regulations and standards. This solution is available on premises and in the cloud.